When you’re off campus, you can still connect to NC State campus resources, like license servers and on-campus computers. To do so, you need to install and connect to the campus’ virtual private network, or VPN. 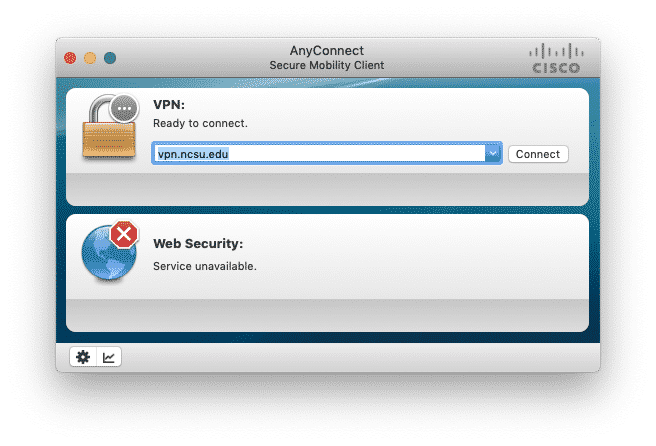 In this blog post, we’ll show you how to install and connect the AnyConnect VPN client to be able to reach campus resources from anywhere with an internet connection. 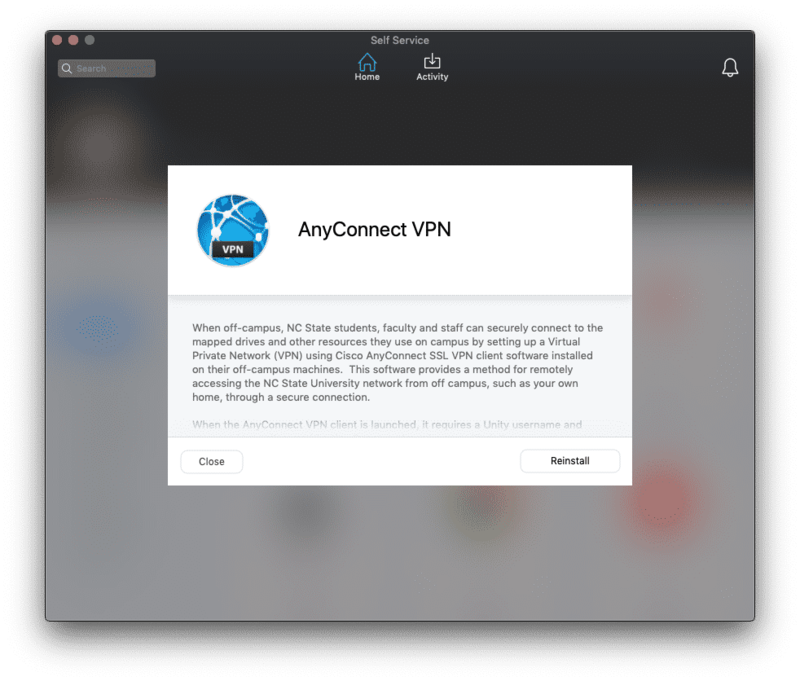 If you’re using a managed NC State Mac, you can install the VPN client with one-click using the Self Service app. First, if you’re not using an NC State managed Mac, install the latest available version from OIT’s VPN website. 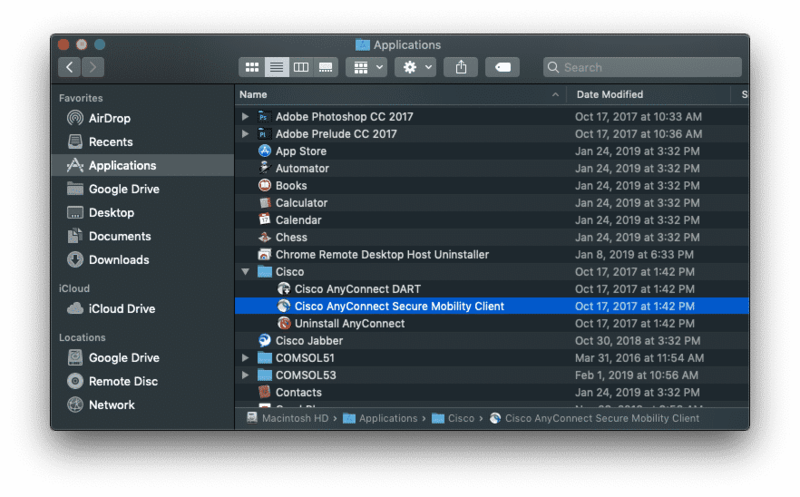 Then, once the installation is complete, you can launch the Cisco AnyConnect Secure Mobility Client, as seen below in the Applications folder. Once it is launched, you’ll see the login screen shown in the next screenshot. From here, you can connect to the vpn.ncsu.edu server with your Unity ID and password. Once it successfully connects, it will secure any connections you make to campus resources only. This does not secure your personal web traffic to other destinations that are not on campus at NC State. For more information on what the VPN does does not protect, check out OIT’s VPN FAQ. Cisco AnyConnect Secure Mobility Client. Now that you’re connected, you can go about using campus resources the same way you would if you were sitting in your office. When you’re done, you can disconnect from the VPN on the top doc of your Mac. It’s that simple! If you have questions, or we missed a step that confused you, drop us a comment below and we’ll be sure to get you up and running as soon as we can.